This Just Tested: How much impact does an offline campaign have online? One of my favorite aspects of working in a family of research companies is getting to see new theories tested. It is a core essence of our “Discover what works” tagline, and when a recent “discovery” experiment came across my desk the other day, I couldn’t help but want to share its implications with our audience. Let me explain the background and give you a little preview of the discovery that will be fully revealed in today’s web clinic. We are currently running tests with a large subscription-based news service that has a large direct mail (DM) aspect to their marketing campaigns. We saw this as an opportunity to test some of the hypotheses we have been formulating related to the connection between offline and online efforts. We wondered how many DM recipients were wandering off the beaten path of a nice clean and trackable vanity URL. We questioned how many people who received the offline campaign were rebelling against the directions and forging their own way to what they wanted. And overall, how much of this company’s generic website traffic was taking part in this underground rebellion? 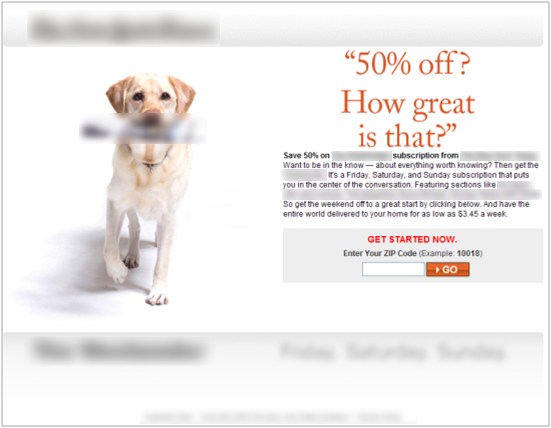 Our thought here was that if there was any traffic coming from the direct mail to these generic offer pages, that the images would increase relevance and have a positive impact on conversion if many people were coming from the DM campaigns. We were hoping to see a difference in the results over time related to the offline campaign. The results were stunning. During the two weeks that the DM was out, we saw a 124% lift in subscriptions for the new page. After the two weeks, however, the conversion rates for the page that integrated imagery from the DM campaign went back down to its historical average. This supported our hypothesis that offline efforts have a larger impact than might be expected and that people don’t necessarily follow the prescribed path of a DM campaign. For this company, many ended up on generic product pages. What does this test mean for all of us? I believe we can learn two things: 1) If you are running offline campaigns, be aware that they may be having a larger impact than you think and 2) Identifying where response to your offline campaigns overlaps with your online visitor’s engagement, and establishing a connection between the two messages can generate significant response. For this company, discovering that overlap and connecting the messages meant 124% more subscriptions. What might it mean for the rest of us? For a deeper explanation and analysis of this experiment, activate your FREE MarketingExperiments email subscription to be notified when the replay of this web clinic is available. Thank you for this. I am few weeks away doing online/offline test myself and I needed to get my thinking wheels in motion. Awesome post and I am glad it worked for you well!